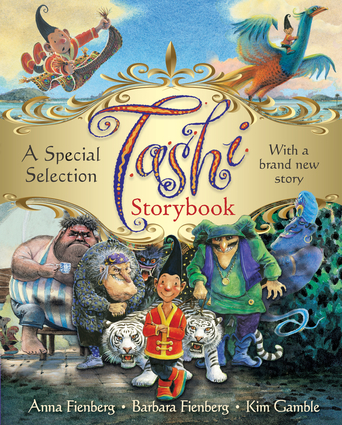 Tashi has amazing adventures, like the time the Baba Yaga's house blew into the village on the winds of a terrible storm, and when he found a genie and rode on a flying carpet. Tashi has stories about a big smelly giant, a haunted house, and a proud golden phoenix. And he must be very clever when the Book of Spells is stolen, and almost magical when he tries to save the Baron's dog. Tashi's friend Jack loves hearing Tashi's stories, and so do children all over the world. In this storybook, Anna and Barbara Fienberg have chosen some of their favorite Tashi stories, and written a new one called "Kidnapped!"